I am writing to let you know that we are in discussion with NSF about organizing a 2014 DR K-12 PI meeting, preferably in early August. While there has not been a final sign-off by NSF, we are comfortable suggesting that you pencil in this meeting time. If the meeting does take place, we will use a similar model to previous meetings (the last was held in June 2012), with an emphasis on collaborative, interactive sessions; poster sessions; meetings and roundtables with program officers; and networking opportunities. For new PIs, we will include time for you to meet and discuss challenges you’ve experienced as new grantees. We will send an email announcing the date and location as soon as those details are confirmed. In the meantime, if you would like to serve as an advisor for the meeting, please email me! CADRE approached 2014 with a desire to increase dissemination and communication of the DR K-12 community's work. This newsletter and the CADRE website (cadrek12.org) are designed to reflect this intention. The website includes a new spotlight examining DR K-12 gaming and simulation projects, as well as archived spotlights on engineering and earth/environmental science projects. In this newsletter, you can also find a link to listings of grantee presentations at upcoming national meetings and recent publications on project work. If your work is not already included, please let us know so we can continue to celebrate and share the DR K-12 community’s accomplishments. If you are thinking about publication and presentation deadlines, the CADRE list of STEM education conferences and publications has been updated and is available on the CADRE website. Our new cohort of CADRE Fellows have been quite active. Over the past 3 months, they have been learning about what it takes to write articles that have publishing potential. They are beginning to understand it is a major effort, and are now gathering tips and know-how from peers, Fellow alumni, and PIs who have been generous with their time. We would like to send a special thanks to those of you who have contributed to these and other efforts so far in 2014—Jamal Abedi, Jason Chen, Lynn Goldsmith, Roy Gould, Katherine McNeill, Jorge Solis, Suzanne Wilson, and Charles Xie (CADRE Fellows); Okhee Lee (ELL); and Jodi Asbell-Clarke, Diane Jass Ketelhut, James Lester, and Eric Wiebe (Gaming). Join us for a virtual tour of the CADRE website, where DR K-12 community members will learn how to maximize their projects' presence on the website and take full advantage of the site's features and resources. Participants will be able to ask questions regarding any of the material presented, or the role of CADRE and the website in general. Get access details for this webinar here. This virtual event, hosted by CADRE and led by NSF Program Officer David Campbell on December 16th, was designed to introduce DR K-12 awardees to the ins and outs of project management—including information on evaluation and reporting, advisory boards, Institutional Review Boards (IRB), and more. Download the slides and watch the recording here. 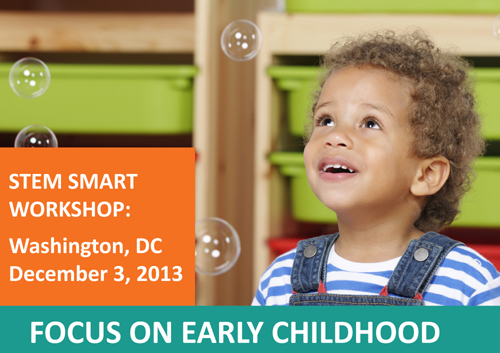 On December 3, 2013, the latest workshop in the STEM Smart: Lessons Learned from Successful School series was held in Washington, DC. This workshop focused on the importance of STEM learning and early intervention in pre-Kindergarten through third grade, and attracted practitioners, researchers, and policy-makers from all across the country. The day comprised plenary sessions conducted by experts in the development and education of young children, and breakout sessions featuring projects, resources, and initiatives funded by the National Science Foundation. Presenters at this event included DR K-12 project members Kimberly Brenneman, Doug Clements, Ximena Domínguez, Richard Lehrer, Ashley Lewis Presser, Amanda Sullivan, Phil Vahey, and Betty Zan. This series of workshops aligns with the evidence presented in the National Research Council reports Successful K-12 STEM Education and Monitoring Progress Toward Successful K-12 STEM Education. Review the agenda, download presentation materials, and watch the plenary presentations here. See what attendees, NSF, and CADRE had to say at the workshop, and join the conversation: #nsfstem. Visit the event page for updates on the next event in the series, scheduled for May 12, 2014 at Olin College of Engineering, which will focus on research, programs, and resources to improve career and technical education across secondary and post-secondary levels for middle-skill STEM occupations. 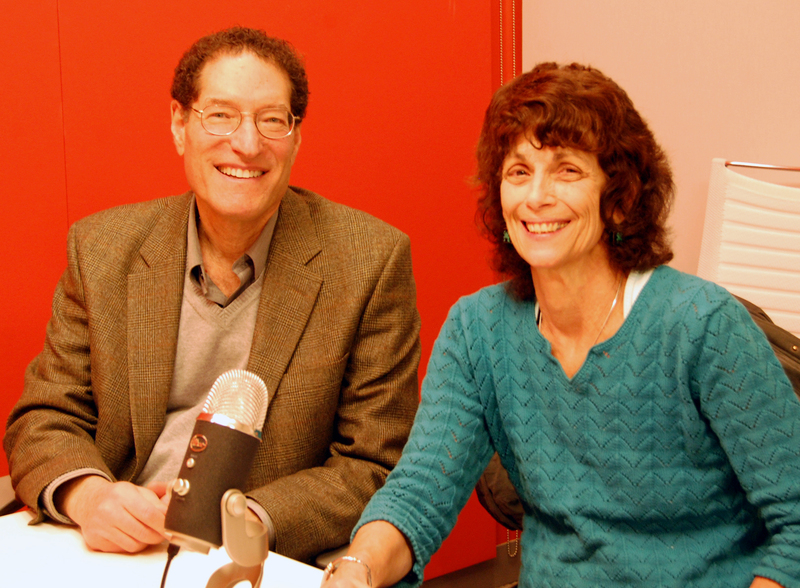 We recently invited DR K-12 PIs Roy Gould (Harvard-Smithsonian Center for Astrophysics) and Jackie Miller (EDC) to talk with us about their work, and specifically their use of story in science. Why is story such a powerful tool in the classroom? Listen in. Let others hear your story, and the ideas that drive your innovative work. If you would like to volunteer to be in our next Stories and Perspectives podcast, learn more here. CADRE invites early career researchers and developers to contribute to a brief on the career trajectories, needs, supports, and contributions of early career grantees in the DR K-12 program. In the interest of developing the field’s future leaders from within the DR K-12 network, the brief will seek to inform several audiences—emerging researchers and developers, those who support them, and policymakers—about what can be done to improve the processes and infrastructure that support early career grantees. Contributors will have an opportunity to give voice to their experiences and inform discussion about improvement as they provide input on the design and development of the brief and participate in an interview and group phone conversations. In addition to describing early career issues and experiences, the brief will illustrate early career grantee contributions to the field and offer recommendations for each intended audience. Contact Derek Riley (driley@policystudies.com) if you are an early career researcher or developer (i.e., CAREER grantee, first-time PI or Co-PI, recent CADRE Fellow, project staffer aspiring to be a PI/Co-PI within several years) with interest in contributing to this brief. PIs are welcome to pass this invitation along to early career colleagues. In recent years, there has been increasing recognition and exploration of the potential for technology resources such as games and simulations to support science and math learning. The National Science Foundation’s DR K‑12 program has funded a portfolio of projects developing and researching innovative resources and models for gaming and simulations in STEM education. The current Spotlight on Games & Simulations highlights this work and provides examples of programs that show promise for advancing these fields. Visit CADRE's Spotlight on Games & Simulations. View an archive of past spotlights on CADRE's resources page, which includes the recent spotlights on Engineering and NGSS & the Environmental and Earth Sciences. The CADRE Fellows have been busy this winter! Following an in-person meeting to kick off the year’s activities, the Fellows had opportunities to learn about the writing and publishing process with Jorge Solís (former Fellow and associate professor at The University of Texas at San Antonio) and DR K-12 PI Jamal Abedi (on sabbatical from UC Davis; visiting professor at UC Irvine). Between sessions, Fellows worked collaboratively on their own writing projects, where each Fellow was responsible for starting a paper intended for publication, writing a letter of inquiry to editors of potential journals for publication, or editing a manuscript that was close to publication. Most recently, the Fellows joined Jason Chen (former Fellow and assistant professor at College of William and Mary) and Suzanne Wilson (Neag Endowed Professor at University of Connecticut) to discuss the navigation of academic career pathways. The next virtual meeting will focus on nonprofit careers. Our appreciation in advance goes to Britte Cheng (SRI), Jamie Mikeska (ETS, also a former Fellow), and Paul Goldenberg (EDC) who will be presenting in this webinar. For those who missed the Winter 2013 newsletter’s resources and tips for writing and publishing in STEM education, find them here. 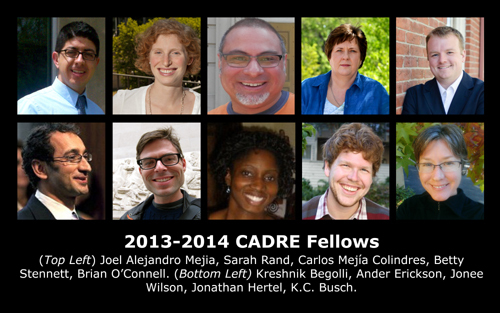 Visit the CADRE Fellows page if you have yet to meet the Fellows or you would like to learn about the CADRE Fellowship. Thank you to everyone who filled out CADRE's survey on recent publications, upcoming presentations, and project websites. We've compiled the results in Excel files (see link below). This information has also been added to the cadrek12.org website: publications submitted through this survey have been added as resources; DR K-12 presenters have been added to conference event pages in our calendar; and project websites have been added to project pages. See the current list of project websites, upcoming presentations, and recent publications here. Forget to send us information from your project? It's not too late! We update this information throughout the year. Join CADRE partner Alina Martinez (Abt Associates) and DR K-12 community members Joseph Taylor, James Pellegrino, and Christopher Wilson at a symposium: Learning as a Community—Maximizing the Impact of Research Syntheses in Science Education. During this session, Martinez will discuss CADRE’s work on the compendia of instruments for STEM education. Visit the 2014 NARST Conference webpage for program information. CADRE is pleased to share updated lists of education publications and conferences, which now include 2014-2016 information. These lists feature up-to-date instructions (where currently available) for manuscript and presentation proposals. Event information is also available on the CADRE website calendar. Follow this link for a list of future conferences. The Center for Advancement of Informal Science Education (CAISE) is pleased to announce that the EBSCO Education Research Complete database is now available to registered users of InformalScience.org. The database offers abstracts for more than 2,400 journals tinand full-text access for over 1,000 journals (as well as books, monographs, and education-related conference papers). Topics include education, social science research, and evaluation with coverage across many sectors of STEM education. This new data service complements the more than 8,200 Informal STEM Learning resources available via the Informal Commons collection on InformalScience.org, including: project descriptions, evaluation reports, research and evaluation instruments, research and reference resources, and instructional materials. Over the coming months CAISE will be selecting and indexing relevant full-text research articles so they appear within Informal Commons search results. The EBSCO data service is for non-commercial use and is exclusively available to registered and logged-in users of InformalScience.org. Join InformalScience.org for free. It just takes a few minutes, and once you join, CAISE invites you to return to the site, complete your profile, and contribute resources. Search the EBSCO Education Research Complete database and access a CAISE-curated list of featured topics relevant to informal STEM education. Contact Trevor Nesbit (tnesbit@astc.org), CAISE Director of Online Engagement, with questions about the new EBSCO data service or the Informal Commons collection. Do you work with an outstanding K-6 teacher? Nominate them for the 2014 Presidential Awards for Excellence in Mathematics and Science Teaching. Deadline is April 1, 2014. Learn more about PAEMST and how to nominate a teacher here.